Funny, one of the most anticipated products (IMHO) just pop out, you can bet you will hear more and more about it in the next months to come, VPLEX / VE was just a part of one of the biggest (if not THE biggest) DPDA launcher ever..
the theme was Data Protection for a Software-Defined World. There are 3 specific sub-themes that support the overall launch. These sub-themes are key requirements for delivering effective data protection in a software defined world. First – Delivering “data protection as a service” supports the shifts that our customers are making toward offering “IT as a service” – Effectively, becoming a service provider to the business. This also extends the opportunity to EMC Business Partners to offer “data protection as a service” to their end user customers. Second – Empowering data owners – and by this we mean application, virtual and storage admins – with visibility and control of their own data protection needs, from familiar interfaces, removes the need for data protection silos and attacks the problem of “accidental architectures”. Most industry analysts agree that there’s a need for a tiered recovery plan, in order to meet multiple services levels – from zero downtime and no data loss, to various point in time copies, to secure long term retention with archiving. 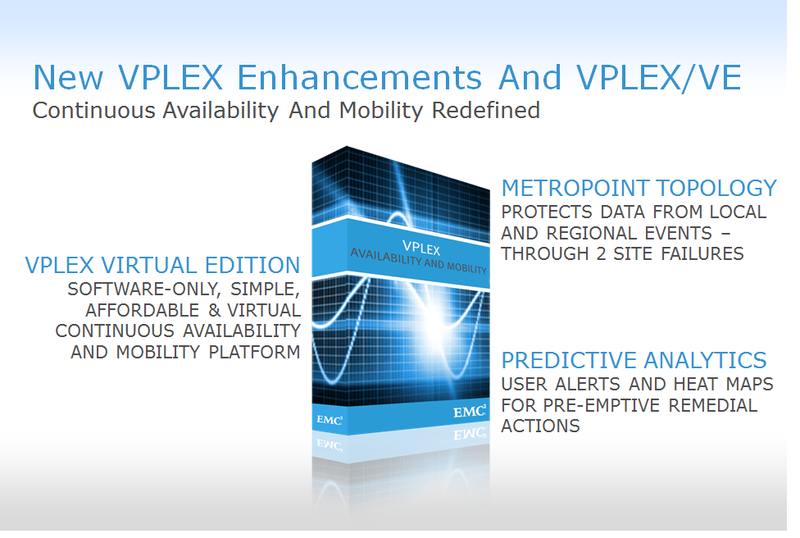 • VPLEX/VE is a new entry point for application data availability and mobility. Reduced TCO derived from deployment on standard ESXi server hardware and low cost iSCSI infrastructure. 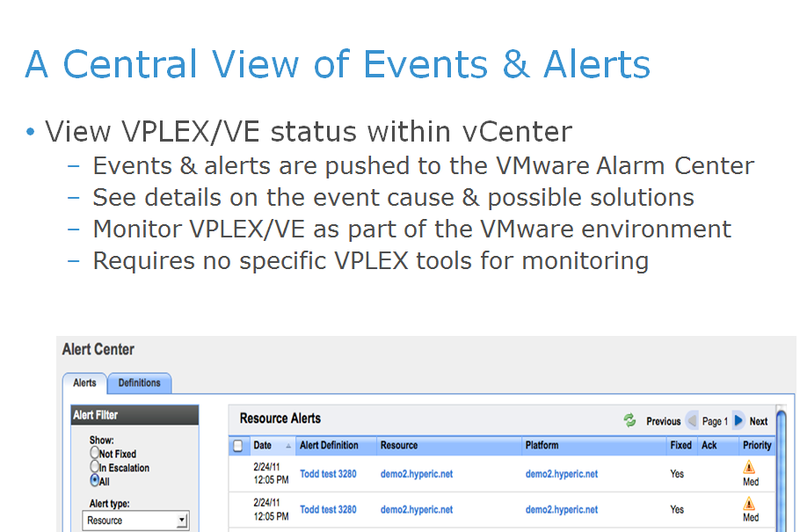 VPLEX/VE is a VMware-centric solution with deep VMware integration, managed and monitored through vCenter. 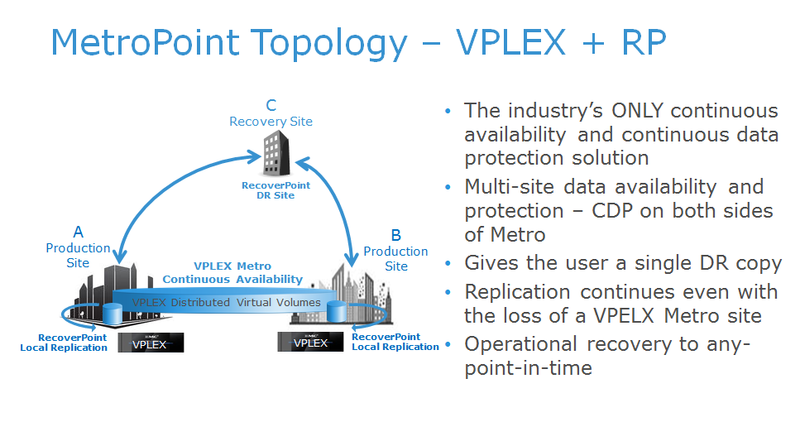 • VPLEX 5.4 adds support for MetroPoint Topology – Providing multi-source replication to a 3rd site – extending the VPLEX and RecoverPoint continuous availability story to include protection against events that could impact two sites, and operational recovery from data loss or corruption with any point in time RecoverPoint functionality. 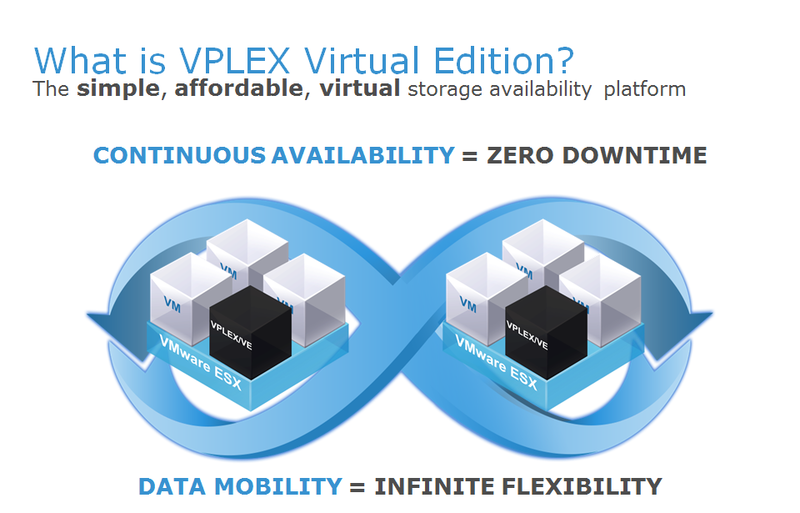 • In the same timeframe as these VPLEX releases, ESA 2.3 for VPLEX delivers new predictive analytics capabilities, for VPLEX and EMC storage attached to VPLEX. No competitive solution offers the continuous availability and protection that MetroPoint delivers. Users get what they want – a single DR copy of their data, multi-site protection, no impact even though failures of two sites. VPLEX/VE takes the same great technology and the associated use cases the industry has come to know and trust and delivers them as a set of virtual appliances in a fast and easy to install VMware vApp package. This is unique in the industry as it is the first and only continuous availability platform that is designed to run natively on the customers VMware infrastructure. This simple, affordable and virtual storage availability platform is specifically designed midmarket customers who are looking to achieve the highest levels of availability for applications running in their VMware environments running on iSCSI storage infrastructure. Now the storage availability conversation can extend beyond the storage admin to include the vAdmin who will directly benefit from improved availability at the VM level. VPLEX/VE provides benefits to a different set of customers than the traditional appliance based VPLEX. VPLEX/VE will be particularly valuable to the following customers. Customers with VMware environments and iSCSI networks. VPLEX/VE supports iSCSI networks but not FC networks. iSCSI networks are common at SMB customers and branch offices of enterprises because of the lower implementation and maintenance costs for iSCSI. 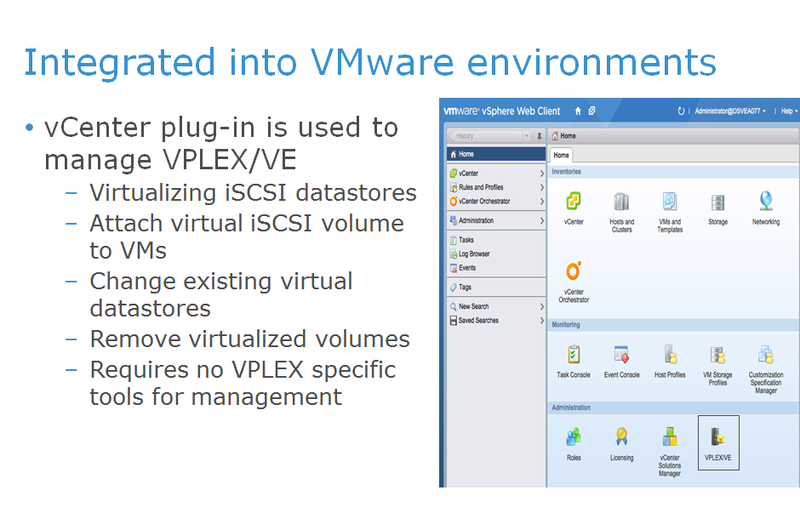 VPLEX/VE is tightly integrated with Vmware and is managed through the vCenter GUI. All management activities such as provisioning, moving volumes and monitoring storage is done through the VPLEX/VE plug in for vCenter. Customers no longer need to develop new skills in separate management tools. VPLEX/VE benefits customers who want to instantly move VMs between sites. Unlike Storage vMotion, VPLEX/VE continuously mirrors application data (and VM data) between sites so that when a VM Vmotion is directed by an administrator, the VM can move to the new site without delaying for VM data to be copied to the new site. And because this is an active/active mirror of data, VMs can be moved back and fourth dynamically. Storage vMotion requires VM data to be copied to the new location first, before the VM can be moved often taking hours to complete a Vmotion operation. And each Storage Vmotion is a new activity so if a VM needs to be moved back, the VM data needs to be copied back. Similarly, customers who want to load balance between sites can do so instantly and dynamically because the application data and VM data is mirrored between sites. All of this is enabled by VPLEX/VE’s ability to mirror application data and VM data between arrays at a single site or between two sites. 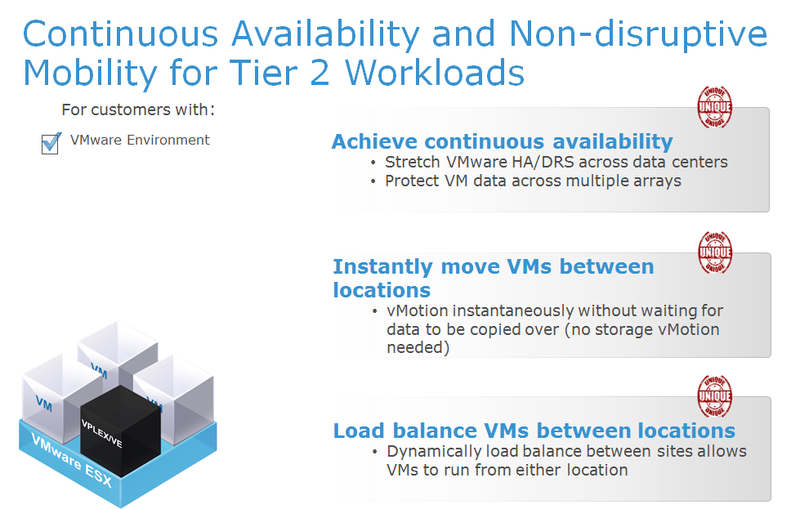 In addition to the added mobility benefits, customers who want to maintain mirrored data between arrays at one or two sites for improved availability can use VPLEX/VE to accomplish this. 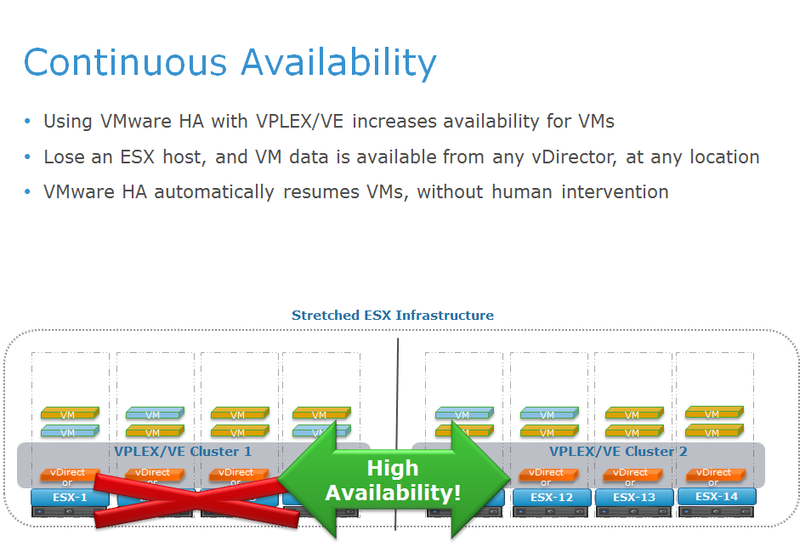 VPLEX/VE leverages many of the unique capabilities of VMware such as Vmware High Availability (HA) to help create a continuously available application environment. 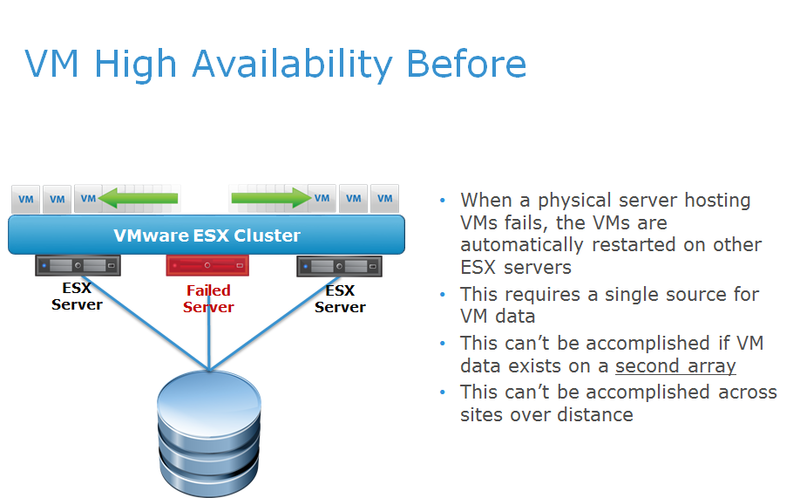 VMware HA provides the ability to automatically restart VMs when a physical ESX host hosting those VM’s suffers a failure. Under these circumstances, VMware directs a new ESX host to reboot the failed VM automatically using the same VMDK data stored on the single array. The challenge is that VMware HA requires a single source of VMDK data. So in the loss of an array or in the loss of a full site, VMware HA is unable to restart servers. VPLEX/VE bridges the gap in VMware HA by mirroring VMDK data across two arrays in two sites but presenting that data as a single volume to ESX hosts. In the even of an outage from something like a site failure, VPLEX continues to make that VM data available at the remaining site. And the ESX cluster is able to AUTOMATICALLY reboot the VMs on the remaining site without any human intervention. 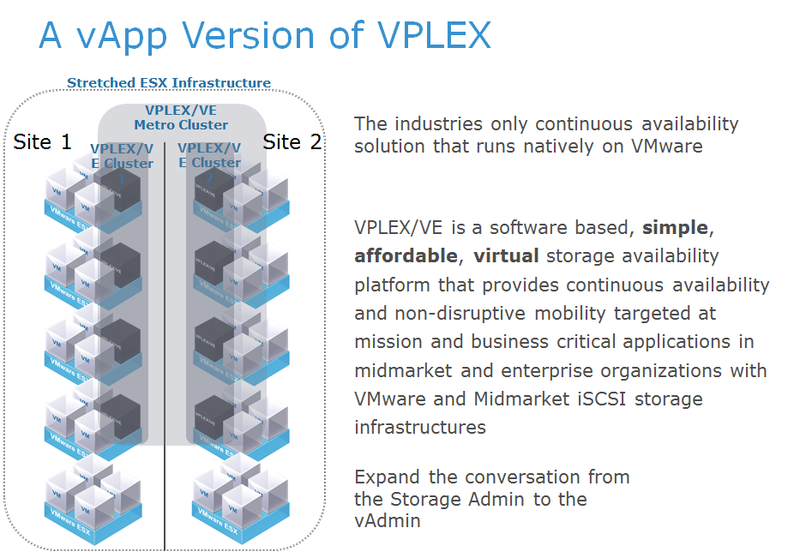 While continuous availability is the key use case for VPLEX/VE and VMware, VPLEX/VE also enhances data mobility for VMware environments beyond what can be achieved by Storage vMotion and Storage DRS. 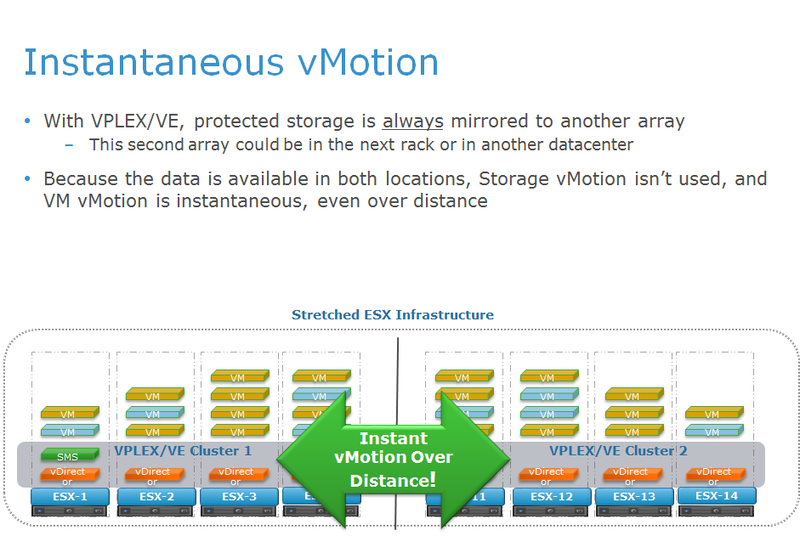 Storage vMotion gives vAdmins a way to non-disruptively move their VMs from one array to another. This can be done in a single site or across sites. 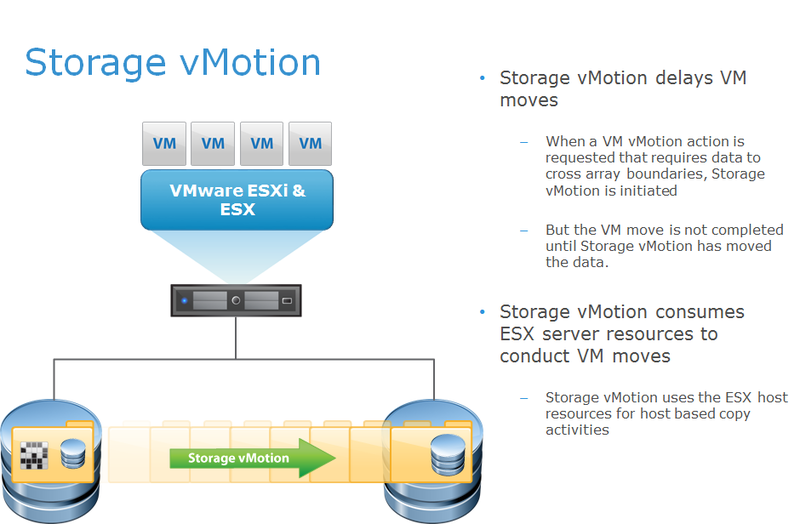 But Storage vMotion will not complete the move of a VM until the VM data move is actually completed. As a result, VM moves can be delayed. This is particularly challenging when multiple VMs are being moved simultaneously. In addition, when a Storave vMotion move is requested, the ESX Host resources can quickly be overloaded by the sudden burst of CPU and resource activity as the VM data is replicated by the ESX host from the old array to the new array. The vMotion move can be completed instantly because the mirror of the VM data can begin to be used as soon as the VM is moved to the new location. 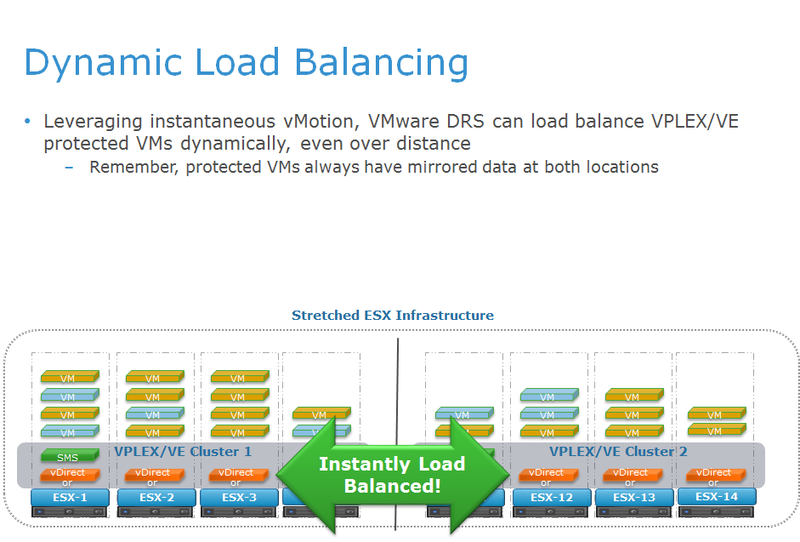 Distributed Resource Scheduling can load balance VMs across your ESX cluster for best use of your compute assets. When DRS requires VM data to be moved to a new location to complete a DRS load balancing move, it uses Storage DRS, a process very similar to Storage vMotion. And just like Storage vMotion, Storage DRS does not actually move the VM until the VM data is replicated to the new array. Also like Storage vMotion, the process of moving data with Storage DRS can consume a lot of ESX host resources in a burst fashion to conduct the load balancing VM data moves. 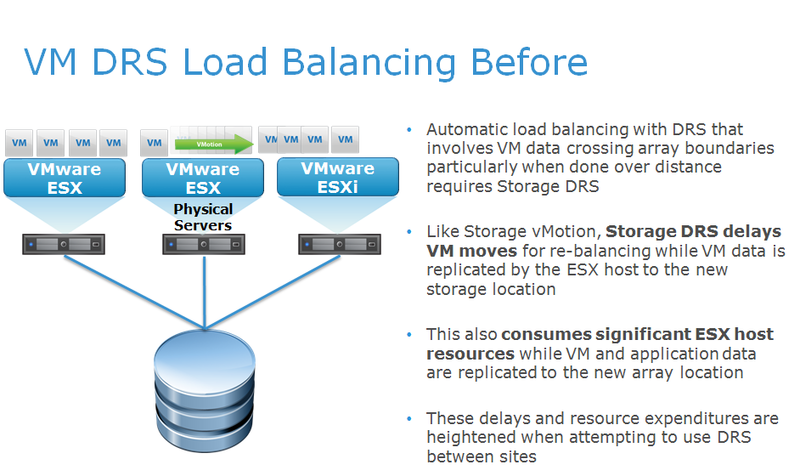 VM moves for load balancing with DRS happen instantly and do not spike the ESX host resource usage in the process.